We’re super excited to be celebrating the sixth annual edition of Hannah Directory this week. If you’ve never yet discovered this gem, we highly recommend seeking it out. If you’re lucky, you might even catch sight of Andrew, the directory organiser, who each year travels across the north of england with a trusty trolley, hand delivering the directory to contributors to distribute. He’s in Newcastle on Wednesday. Working with a new designer each year, the Hannah Directory is a beautifully designed and crafted print publication, plus a website and launch week of events, celebrating the great stuff that people are doing in places in England’s north, and asking how even more of it can happen. Founded in 2013, the directory takes a snapshot capturing some of the year’s best activity in the arts, music, business, new kinds of social organisation, scientific discovery and great stuff from any field. It is named after and inspired by Hannah Mitchell (1872–1956) (no relation, just big inspiration) a suffragette and rebel who tried to create ‘beauty in civic life’ in her work on public libraries, parks and gardens. 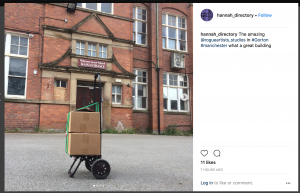 Unlike most awards, which only cover one field, Hannah Directory looks for outstanding contributions in any activity that is for the common good of places in England’s north. Wunderbar is chuffed to be joining all the artists, musicians, community groups, digital technology companies, and policy think tanks that make up the 2018 edition. Most of the contributors to the directory have been recommended by others. Each new link between them is a pathway along which ideas, trust, and even co-operative activity can be shared across the region. This unique network is one of the broadest in England’s north. The directory is a not-for-profit initiative. Contributors are selected on merit and there is no fee for inclusion. The publication does not apply for or receive any public funding. Interested in seeing a copy, or finding out how to get involved? Get in touch with us and we can make it happen. Or find out more from the website, or Andrew Wilson, the directory organiser.